The Dragon Monastic Residency is now full, and we are no longer accepting applications. Thank you for your interest. Please check back in 2018 for information on future monastic residencies. 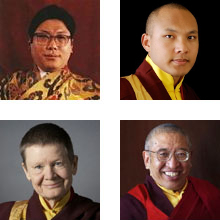 As part of the monastery’s role in helping to hold practice and study within community, the intention is that a period of complete immersion in the dharma offers practitioners the opportunity for processing and deepening which can also benefit the broader society as more people train in this way and return to household life. We are happy to assist you in planning for meeting the prerequisites as well as financial assistance with the required contribution. Please contact us. Space is limited. We will be updating our Residents Handbook and providing a link to download it from this page. The Residents Handbook provides information on living at Gampo Abbey as a resident participating in the residency program.